The Working Group for Planetary System Nomenclature of the International Astronomical Union has today officially approved the naming of two craters on the Moon to commemorate the 50th anniversary of the Apollo 8 mission. The names are Anders’ Earthrise and 8 Homeward. The newly named craters are visible in the foreground of the iconic Earthrise colour photograph taken by astronaut William Anders. It depicts the moment that our shiny blue Earth came back into view as the spacecraft emerged out of the dark from behind the grey and barren Moon. This is arguably the most famous picture taken by Apollo 8. It became iconic and has been credited with starting the environmental movement. Since the Moon is tidally locked to the Earth — it always has the same side facing the Earth — the Earth will never appear to rise above the surface to someone standing on the lunar farside. Orbiting around the Moon, however, gave the Apollo 8 astronauts, Frank Borman, James Lovell, and William Anders this stunning view, before they safely returned home to Earth. The Apollo 8 mission took place from 21 to 27 December 1968. After completing 10 orbits around the Moon on Christmas Eve, broadcasting images back to Earth and giving live television transmissions, the crew returned to Earth and landed in the Pacific Ocean. The Working Group for Planetary System Nomenclature (WGPSN) of the International Astronomical Union, who named the craters, is the authority responsible for the naming of planetary features in our Solar System. The two named craters were previously designated by letters. Two lunar craters visible in an astronaut's photo of Earth rising above the moon have been named in honor of the 50th anniversary of the historic mission that captured that now iconic view. The Working Group for Planetary System Nomenclature of the International Astronomical Union (IAU) approved "Anders' Earthrise" and "8 Homeward" as the official new names for the two craters. The working group is the internationally-recognized authority responsible for assigning names to the planetary features in our solar system. On Dec. 24, 1968, NASA astronaut William "Bill" Anders, together with his Apollo 8 crewmates Frank Borman and James Lovell, became the first humans to orbit the moon. As they emerged aboard their Apollo command module from the far side of the moon, they witnessed the crescent Earth rising above the lunar surface for the first time. Anders, equipped with a 70-millimeter color film camera, photographed the scene, which became known as "Earthrise." The image subsequently appeared on the cover of magazines, newspapers and books and was reproduced on a 1969 U.S. postage stamp. "This is arguably the most famous picture taken by Apollo 8. It became iconic and has been credited with starting the environmental movement," stated the IAU. "We came all this way to explore the moon, and the most important thing is that we discovered the Earth," Anders famously said. The Apollo 8 crew completed 10 orbits of the moon before returning home to Earth on Dec. 27, 1968. "Anders' Earthrise," which previously was designated "Pasteur T" for the large impact crater in which it is located, is 25 miles in diameter (40 kilometers). It is clearly visible in the foreground of Anders' Earthrise photograph, hence its newly-assigned name. "8 Homeward" is smaller in size, about 8 miles across (12.5 km), and is seen on the moon's horizon in the "Earthrise" photo. Originally designated "Ganskiy M," "8 Homeward" is intended to represent the safe return of the Apollo 8 astronauts. The names were based in part on the references in two books: "Earthrise: How Man First Saw the Earth" by Robert Poole (Yale University Press, 2010) and "Apollo 8: The Thrilling Story of the First Mission to the Moon" by Jeffrey Kluger (Henry Holt and Company, 2017), according to the IAU. 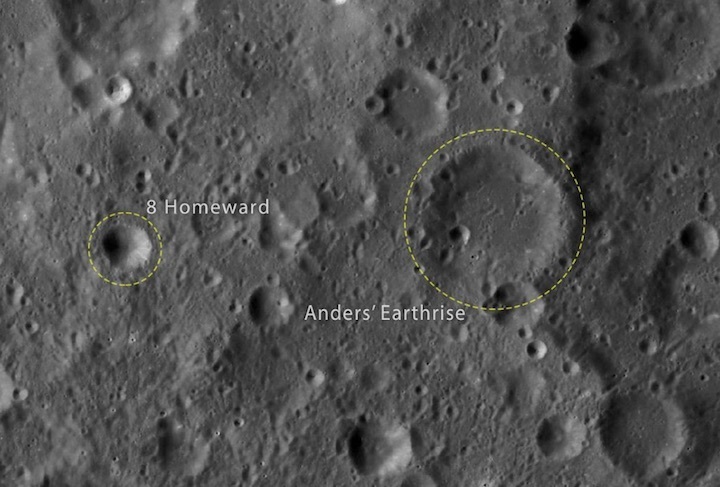 "Anders' Earthrise" and "8 Homeward" are not the first craters on the moon named in honor of or as a result of the Apollo 8 mission. In 1970, the IAU named three lunar craters after the three astronauts. "Borman," "Lovell" and "Anders" are located on the far side of the moon near three craters named for the fallen Apollo 1 crew who were tragically killed in a fire during a Jan. 27, 1967 test on the launch pad. 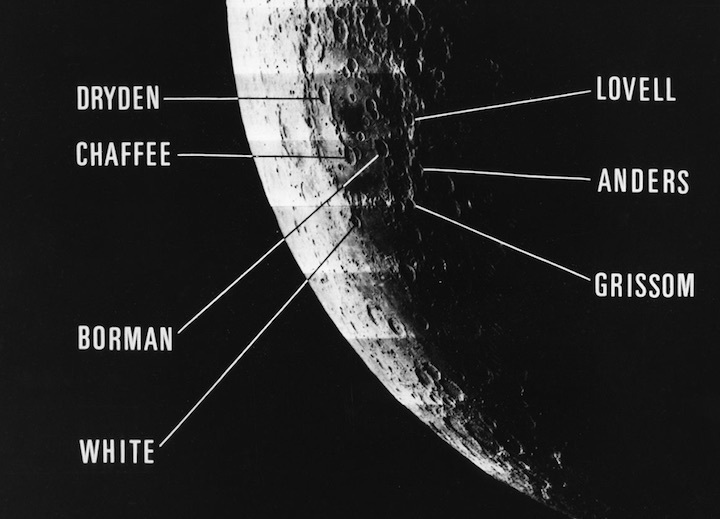 The Apollo 8 astronauts also appealed to the IAU to formally recognize the feature names they coined for landmarks they identified during training and later saw from lunar orbit. "If it hasn't been pre-named or if it isn't well recognized by a name, then it should be named by the people who see it, who recognize it and who have things to do with it," Lovell said in a 2013 interview with collectSPACE. Lovell was specifically referring to "Mount Marilyn," a triangular mountain that was used by the Apollo 10 and Apollo 11 crews as a descent marker. Lovell named the feature after his wife and for 49 years, the IAU refused to acknowledge it. That changed on July 26, 2017, when the Working Group for Planetary System Nomenclature officially recognized "Mount Marilyn" along with two other Apollo 11 landing site feature names.